Do You Have Some Evergreen Broadcast Emails? 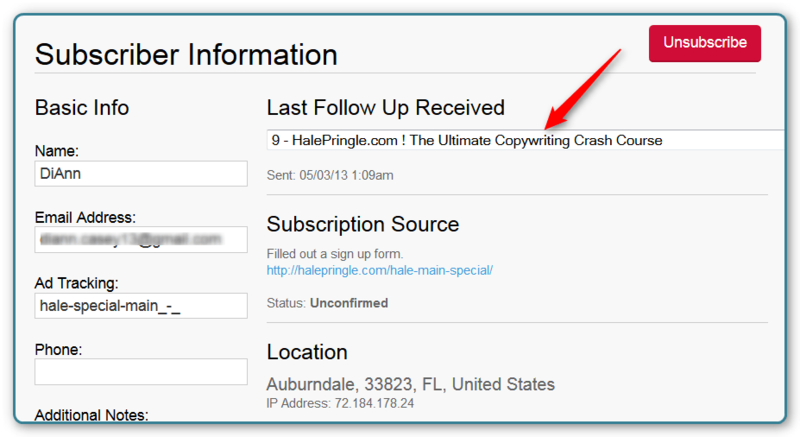 Inserting Emails into a Follow Up Sequence Without Showing Them to Subscribers a Second Time is Easy. New Follow-up Emails to insert into your sequence? Again, Inserting Emails into a Follow Up Sequence Without Showing Part of you Sequence to Subscribers a Second Time is Easy. These two scenarios are actually the same. In both cases if you are not careful, you will send most of your subscribers one or more emails that they have already seen. Part of building a good relationship with your subscribers involves you avoiding doing things that annoy them. Sending exactly the same email several times is annoying. You can use the following procedure for either case. Background: When leads sign up for one of you lists and become subscribers, AWeber starts to keep two special pieces of information about each subscriber. 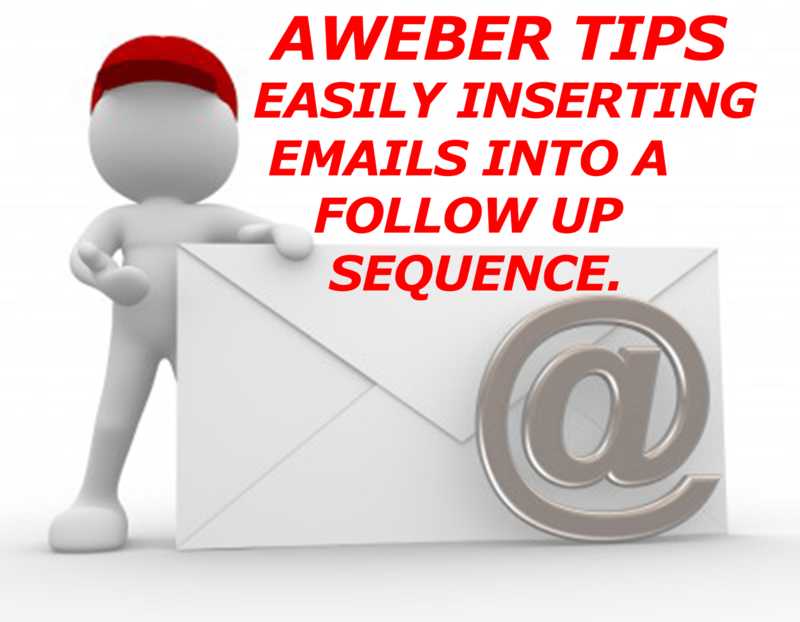 AWeber keeps the number of the last email each subscriber received in your sequence and AWeber keeps the date each subscriber received their last email. 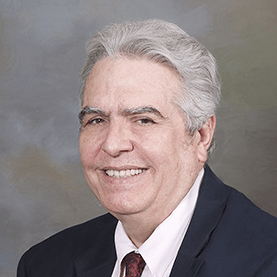 AWeber uses these two data points to determine “Is there a higher number available and if there is, have the required number of days gone by to qualify the subscriber for the next email. Example: You have 30 emails and Joe has seen 9 of them. He saw number 9 three days ago. His “last number read’ would be 9. If email number 10 is scheduled to go out 7 days after number 9 then Joe isn’t due to see number 10 for four more days. Now let’s add a new email at position number 4. The new email becomes number 4 and all the emails that were numbered 4 and up are bumped up by one. The old number 9 is now number 10. If this number 10 is scheduled to go out 2 days after the new number 9 then Joe is already a day late. AWeber will send him the new email number 10 ASAP. All of this is well and good, except that Joe has already seen number 10. (it was number 9 when Joe saw it.) He is going to get that email again. Many subscribers do not like this and you may get some unnecessary unsubscribes from this. If you insert more than one email, your subscribers who are later in the sequence are going to see several emails a second time. We need to learn how inserting emails into a follow up sequence can be done without sending duplicates. Here we see emails number 8, 9, 10, 11, 12 and 13 of a sequence. Number 10 is the last one that anyone will see since the 11, 12, and 13 are not scheduled to go out for 999 days. Email Number 13 dragged down to become number 10. You can see that the email with the subject line “New Email that we are going to put…” has been dragged down to the number 10 slot. 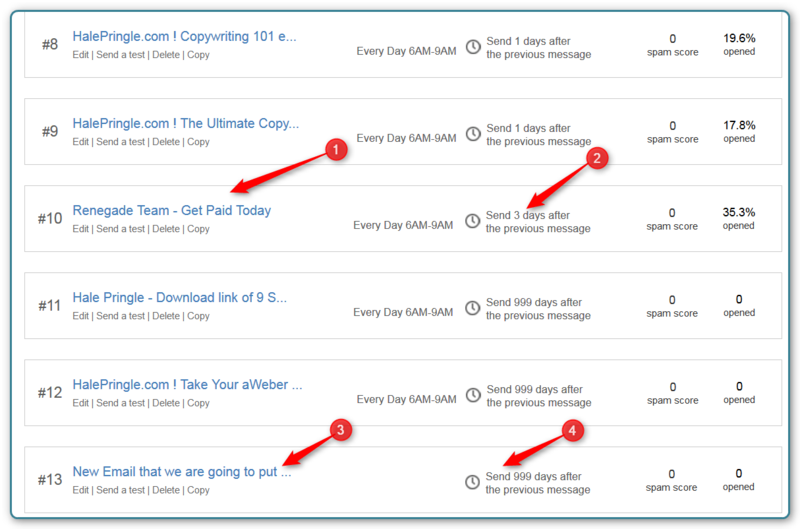 The email “Renegade Team – Get Paid Today” was number 10 and now it is number 11. Since email number 10 is still set to go out 999 days after number 9, no one is going it see it for about 3 years. They won’t see number 11 either since it is scheduled to go out 3 days after number 10. If we look at the subscriber data, we need to click on a particular subscriber to see where they are in the sequence. The area the arrow is pointing to is actually a drop down menu that lets you change where this person is in the sequence. These is a SAVE button (not shown.) 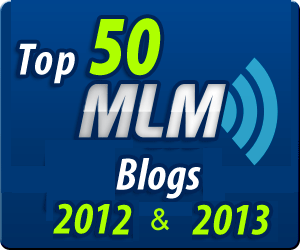 This is slow going if you have more than a very few subscribers in your list. Step 1: Go ahead and create your new email number 4. Put it at the end of the sequence and schedule it to go out 999 days after the previous email. When you are happy with it continue to Step 2. Just like email #13 in the first image above. Step 2: Contact AWeber using the Chat Help during the work day. You will need to have the list name and the last four digits of the credit card you use to pay for AWeber. Ask them to bump the “last read counter” for any subscriber in your list whose current number is 4 or higher. 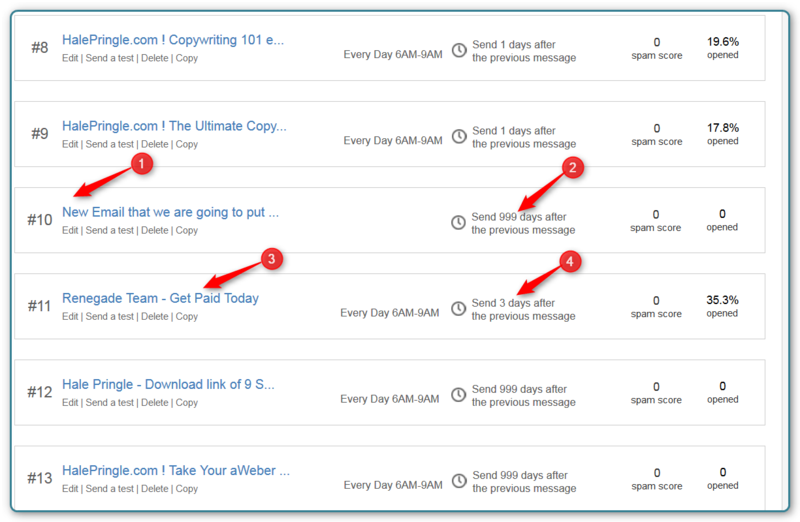 See how easy inserting emails into a follow up sequence without sending duplicate emails is? You can use this technique to add a whole campaign in the middle of your follow-up sequence (just have AWeber bump the counters by 10 if you are adding 10 new emails) or to add an evergreen broadcast to the end of your sequence so that it is always there. Subscribers who have seen all of your follow-up emails don’t need to see the new email in the sequence. They saw it as a broadcast. Inserting Emails into a Follow Up Sequence – It is easy. If you know how!